Martha was upset over all the work she had to do, so she came and said, "Lord, don't you care that my sister has left me to do all the work by myself? Tell her to come and help me!" The Lord answered her, "Martha, Martha! You are worried and troubled over so many things, but just one is needed. Mary has chosen the right thing, and it will not be taken away from her." 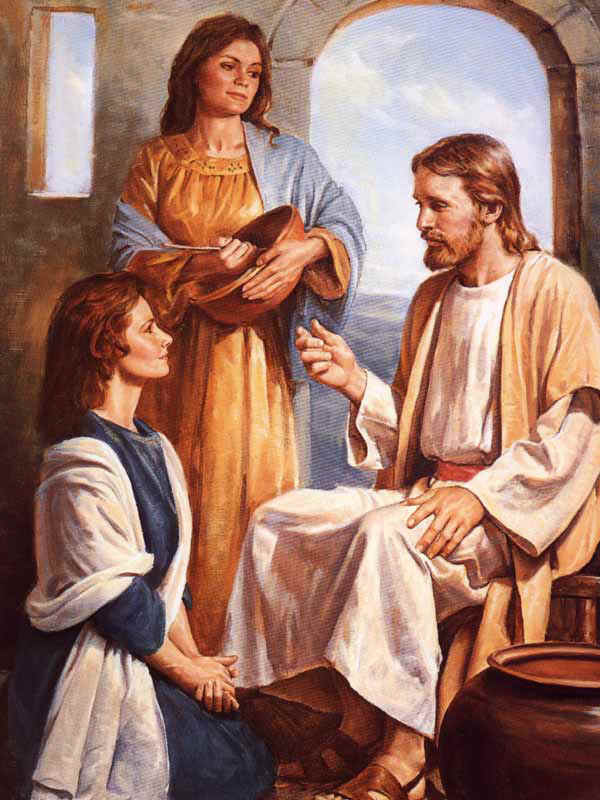 The story of Jesus’ visit to Mary and Martha’s place and what happened in the lead up to mealtime was easy to understand when we heard this story in Sunday School. It was easy to see the point – Martha was too busy in the kitchen to have time to listen to Jesus. Mary did the right thing. The lesson ended reminding us that we should always make time to spend with Jesus. There’s nothing wrong with that kind of a conclusion but now from an adult’s perspective the story is not as straight forward as it seems. Life is much more complicated as an adult. We can appreciate Martha’s point of view because our lives are packed with so many demands. We understand what Martha was going through and how she felt. In Jesus’ time custom required that when you welcomed a guest, you must do certain things, or you are insulting the guest. A few chapters earlier we hear that Simon the Pharisee invited Jesus to dinner and failed to busy himself doing the things that were normally done when a visitor came for a meal. Simon had failed to greet his guest and wash his feet and Jesus was quick to point out Simon’s errors as a host. Likewise here, Martha is busy doing what was expected. Mary wasn't. What is more important - being busy serving the Lord or sitting quietly and listening and learning? Who was right Martha or Mary? Well, according to Jesus’ response to Martha’s complaint about Mary not pitching in and helping in the kitchen, Mary had chosen the right thing. Mary was following Jesus’ own advice, "People do not live on bread alone, but on every word that comes from the mouth of God". But that just confuses me more. Immediately before this incident Jesus tells the story about the Good Samaritan. A man asks what he must do to receive eternal life and Jesus answers, "Love God and love your neighbour and you will have eternal life". He goes on to explain how to do this with the story of a Samaritan who, unlike previous passers-by who did nothing, got busy helping the man lying wounded on the side of the road. Jesus’ final words are "Go and do the same", meaning, "Go and get busy showing love to others whenever the opportunity arises and you will have eternal life". It’s clear from this that being a follower of Jesus involves a lot more than sitting and listening. But today we hear Martha being taken to task because she was busy showing her love for Jesus by cooking up a storm in the kitchen. Note carefully Jesus doesn't tell Martha that she shouldn't be serving; it’s good to serve others and to care for their physical needs. But what Jesus does do is to gently rebuke her because ‘she is anxious and troubled about many things’. Her enthusiasm for serving has got her into a panic, so much so that she has forgotten about the guest. She has worked herself up into such a state that it’s all become too much and so has some unkind things to say about her sister. Jesus wants her to see that something is wrong if serving has become a chore and has caused her to become worried and upset. It’s good to be busy serving others but when serving turns into stressful busyness then it’s time to stop what you are doing and listen. As one person put it, ‘There is a time to go and do; there is a time to listen and reflect. Knowing which and when is a matter of spiritual discernment’. Martha needs to make time to listen to Jesus and understand his love if she is to serve him. At that very moment Martha needs just one thing - not the stress a fancy meal is causing her but the Word of God from Jesus himself. Through listening to Jesus she will find new reasons and fresh inspiration for her going and doing whatever she was doing willingly and without complaint. For just a while she needs to stop trying to serve Jesus and be willing to be served by her Lord. Luke's story of Mary and Martha provides us with a parallel situation in our lives. We may identify more with the meditative Mary or with the must-do Martha. There is a time for practical aspects of service in the Body of Christ, and there is also a time for listening and growing in the love and forgiveness of Christ. In fact, church activity and busyness is in danger of becoming empty and meaningless without each person also sitting at the feet of Jesus through the Word and Sacraments and growing in faith and the new life. Whatever our role is in the church and in the community as we share and care for those who need the love of Christ in their lives or as we give of our time in the everyday matters of church life – cleaning windows, tidying the church grounds, providing music in worship, serving on a committee or a task force – we are all in danger of being ‘worried and troubled over so many things’ that we become prime candidates for burnout, disillusionment, discouragement and may even drop out of the church community. When we become ‘worried and troubled over so many things’ we are in danger of taking out our frustration on others. When serving causes us to be ‘worried and troubled’ then it’s time to put aside our busy lives and just spend some time being with Jesus, learning from him, being refreshed and recreated by his Spirit. As I said before, ‘There is a time to go and do; there is a time to listen and reflect’. We would like to think of ourselves as having a good balance between the Mary and the Martha in our lives, but in reality for most of us the Martha in us has virtually taken over. That may be so but let me ask you this, how do we stop being worried and troubled about what has to be done? From where do we draw energy and motivation to do it? How do we prevent burnout and discouragement and disillusionment? if we don’t take the time to stop, listen to our Lord, talk with him, prayerfully think it all through, and let the Spirit guide us? There will always something to be done. There will always be a job that must be performed. There will always be those things and people who will demand so much of your time and energy. But when the going and doing gets to possess you, to leave you with no time for prayer, no time for quiet, no time for the work of the Spirit, then it has become obsessive. And - let's face it - in our culture obsessive busyness is a problem. There is a time to go and do; there is a time to listen and reflect. The time we spend prayerfully meditating, listening, being silent before the Master is just as important as our doing. Then we will know what is important and what is not important as we go out sharing, befriending, working, meeting, witnessing, cooking, painting, gardening and in so doing demonstrate Christ to the world. No doubt all of us get this balance between doing and listening all wrong. We become worried and troubled over so many things. It happens to me and I’m sure it is also your experience. But the great thing about Jesus is that he knows us so well, and even when we get it all wrong, he loves us even more. He knows how we crowd out of our busy lives the listening and being refreshed and re-energised by the Spirit. With the same love and forgiveness that he showed Martha he reminds us that there is no need to be so anxious and stressed – there is a time and place for everything. There is a time to be busy and a time to sit at his feet as he gently tells us of his love for us in spite of all our weaknesses. May God bless you and help you both in your listening to the word and in your doing of it.